( COMPLETE KIT: FRAME, FABRIC, & HARDWARE ) | VORTEX 4 BOW PONTOON/DECK BOAT BIMINI TOP 10' 97-103"
VORTEX 4 BOW PONTOON/DECK BOAT BIMINI TOP 10' 97-103"
VortexDirect.com Bimini Tops are made with the best marine fabric available. The fabric is marine polyester that is treated and sealed in multiple ways. Specifically, it is double polyurethane coated on the bottom, or down side, as well as UV protected and mildew protected. Polyester and acrylic are very similar for bimini tops. Polyester has a very rich color and holds up to UV exposure very well. It also is very strong, resists stretching, retains it shape well. It has a very 'high end' look and feel, in addition to being quite heavy duty. Relative to acrylic, it is more water repellant and abrasian resistant. For bimini tops, polyester was cited as the 'best value' by the Boat OwnersAssociation of the United States. Given all of this, we chose to have our tops and covers made from polyester. It is not just standard polyester, however, as it is marine polyester material that is double polyurethane coated, UV protected, and mildew protected, for extra durability and water proofing. The material is designed such that although it is extremely waterproof, water vapor can permeate it. This is not an issue normally for bimini tops, but for storage/mooring covers, it is very important. If polyester is the best material for covers, it is the best for a bimini top. In effect, it keeps water out, but lets water vapor escape, thus greatly decreasing the chances of mildew, mold, etc. The fabric is 600d, 600 denier, or 7.8 oz weight , making it a very heavy duty material. We use the same material for our boat covers as well, as it is simply the best value. To be fair about it, it is simply the best, even if you take the 'value' out of it. 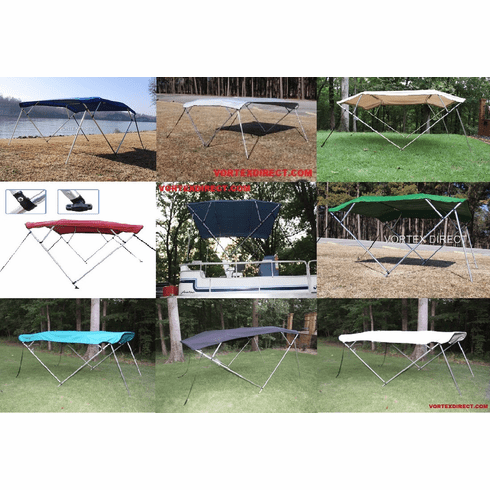 The point is that given all available materials for bimini tops and covers, this is the best choice, even if price were not a concern. 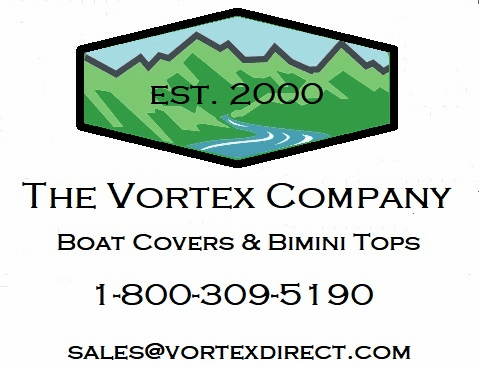 VortexDirect.com Bimini Tops are simply the best option out there due to the quality, warranty, and incredible value. All of our bimini tops are 54" tall, which is standard for pontoon or deck type boats. This height generally gives ample headroom, but does not get tall enough that it is flimsy. To determine which one of our tops you would like to order, first figure out how long of a top you need. This would be roughly the length of the area of shade you want to provide. Our tops come in convenient lengths of 8', 10', and 12'. Then, determine the width of the top that you need. Measure from center to center across the rails where you want the bimini to mount. Vortex Bimini Tops normally mount directly to the top of the rails (pontoon boat) , although they will mount to just about any surface, as they also come with side mounts. We carry 4 main widths of tops. We carry widths of 79-84", 85-90", 91-96" and 97-103". We generally recommend not to keep the Vortex bimin top 'up/extended' position, when not in use. Vortex Bimini tops are extremely waterproof, so leaving them extended gives them the opportunity to collect water, and possible damage the railing due to excess weight. We recommend, when not in use, to store the bimini covered either in the 'radar' position, or collapsed position. This ensures no water collection, and greatly reduces the chances of damage. Damage resulting from excess water collection would not be a warranty issue. Width: easily fits width between mount points of 97-103"
Height: 54" (when mounted to top of rails/gunwales, which averages 18-24" high), makes for nice overall height from boat floor of 6 to 6 1/2 ft high.